One of my favorite things about December is pulling out all of the old Christmas movies I loved as a child. It’s tradition! Every year, among many others, our Christmas movie list included Rudolph the Red-Nosed Reindeer. You remember — the 1960s stop-motion version, complete with reindeer, Santa, an elf who wants to be a dentist (a dentist? ), and my personal favorite, the abominable snowmonster. 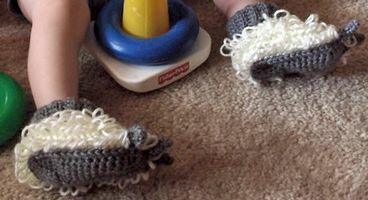 These whimsical slippers are inspired by the abominable snowmonster, but sized for little feet, from baby to small child. They’re perfect for all the little monsters on your list! Loops in sample are approximately 1” long. Instructions are given for the smallest size, with larger sizes in parenthesis. If only one number is given, it applies to all sizes except where indicated. In this pattern, the bouclé loop stitch will be formed with the aid of no special equipment but your own fingers. The lengths of the loops can vary widely, requiring more or less yarn than specified, but it is important to make the size of your loops consistent throughout the piece. To make the loop stitch, *Insert hook in next stitch and before catching it with the hook, loop yarn over your left index finger, then catch yarn with hook and draw a loop through the stitch, yarn over, draw through two loops, and slip your finger out of the loop. Repeat from asterisk across the row. Only a little practice will make you a loop-stitch pro! With Grey Heather, ch 7 (10, 12). Rnd 1: Sc in 2nd ch from hook and each of the next 4 (7, 9) ch. Work 3 sc in next ch and then, working in other side of base ch, sc in each of the next 6 (9, 11) ch. Work 3 sc in skipped ch. Sl st to first sc to join rnd, (17, 23, 27 sc around). Rnd 3: Ch 1, sc in same st as ch and in each of the next 6 (9, 11) sc. Sc inc twice, sc in each of the next 9 (12, 14) sc. Sc inc twice, sc in the last sc. Join rnd, (25, 31, 35 sc around). Making a Small? Stop! Skip to Foot. Making a Medium? Stop! Skip to Foot. Rnd 1: With Off-white, ch 1, and (working in front loop only) sc in each st around. Join rnd, (33, 45, 49 sc around). Rnd 2: Ch 1, and, working through both loops again, lpst in same st as ch and in each sc around. Join rnd, (33, 45, 49 lpsts around). Rnd 3: Ch 1, sc in same st as ch and in each of the next 2 (7, 10) sts. Work [sc dec over next two sts, sc in next st] 6 times. Sc in each of the next 5 (11, 12) sts, sc dec over next two sts, sc in each of next 2 sts, sc dec over next two sts, sc in last 1 (2, 2) st(s). Join rnd, (25, 37, 41 sc around). Rnd 4: Ch 1, lpst in same st as ch and in each sc around. Join rnd, (25, 37, 41 lpsts around). Rnd 5: Ch 1, sc in same st as ch and each of the next 1 (7, 9) st(s). Sc dec over next two sts 7 times, sc in each of last 9 (15, 17) sts. Join rnd, (18, 30, 34 sc around). Rnd 6: Ch 1, lpst in same st as ch and in each sc around. Join rnd, (18, 30, 34 lpsts around). Making a Small? Stop! Skip to Rnd 9. Rnd 7: Ch 1, sc in same st as ch and each of the next (4,7) sts. Work sc dec over next two sts 7 times, sc in each of next (11, 12) sts. Join rnd, (23, 27 sc around). Rnd 8: Ch 1, lpst in same st as ch and in each sc around. Join rnd, (23, 27 lpsts around). Rnd 9: Sl st in each st around. (18, 23, 27 sts around) Finish off. Rnd 1: Ch 18 (23, 27), sl st to first ch to join in a loop being careful not to twist chain. Ch 1, sc in same st as ch and each ch thereafter. Join rnd, (18 23, 27 sc around). Rnd 2-3: Ch 1, sc in same st as ch and in each sc around. Join rnd, (18, 23, 27 sc around). Rnd 4: Ch 1, sc in same st as ch and each of the next 5 (7, 9) sc. Work sc inc in next st 7 times, sc in each of next 5 (8, 10) sts. Join rnd (25, 30, 34 sc around). Rnd 5: Ch 1, sc in same st as ch and each sc around. Join rnd, (25, 30, 34 sc around). Making a Small? Stop! Skip to Rnd 8. Rnd 6: (Medium and Large Only) Ch 1, sc in same st as ch and each of the next (11, 13) sc, sc inc in next st 7 times, sc in each of last (11, 13) sts. Join rnd, (37, 41 sc around). Rnd 7: (Medium and Large Only) Ch 1, sc in same st as ch and each sc around. Join rnd, (37, 41 sc around). Finish off, weave in ends. Insert reinforcement into slipper and, being careful to match shaping, sew securely to inside of slipper (Foot section). Rnd 1 of the reinforcement should be even with the last rnd of Foot. This reinforcement helps prevent your loop stitches from stretching during active play. With Grey Heather, ch 6 (10, 13). Row 1: Sc in 2nd ch from hook and each ch thereafter. (5, 9, 12 sc across) Ch 1, turn. Row 2: Working in back loop only, sc in each sc across.,Ch 1, turn. Repeat Row 2 for a total of 18 (23, 27) rows, eliminating the turning ch on the final row. Working in back loops of the final row, sl st together up original chain. Sew cuff to last rnd of foot. Wear it cuffed or uncuffed! Row 1: Dc in 3rd ch from hook and each of the next 0 (1, 2) ch. Hdc in next st, sc in last st. (3, 4, 5 sts across) Ch 1, turn. Row 2: Sc in first st, hdc in next, dc in last 1 (2, 3) sts. Finish off. Fold in half, sew top of row 2 to base ch. Sew claws to toe of slipper. This work is licensed under a Creative Commons Attribution-NonCommercial-ShareAlike 2.5 License by Melissa Mall. About the Author: Melissa Mall is the crochet pattern designer extraordinaire behind the website, Inner Child Crochet, which offers free crochet patterns, inexpensive patterns to buy, wonderful tutorials and interesting articles on crochet work. Highly recommended!